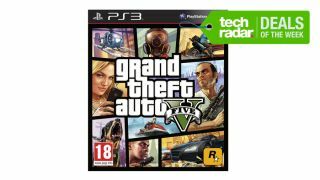 TechRadar's Deals of the Week: GTA 5 and COD: Ghosts each £20! TechRadar's Deals of the Week: GTA 5 and CoD: Ghosts for £20 each! Welcome back to TechRadar's Deals of the Week! This time out we have a choice of bargains for PS3 and Xbox 360 gamers. For a measly £20 each, you can pick up a copy of either Grand Theft Auto 5 or Call of Duty: Ghosts from Amazon. Both are available on Xbox 360 or PS3, so no matter what console you have you can still snag a bargain. But that's not all. If you fancy picking up both games at the same time, you can save a further £5 from Tesco Direct, all in for £35 delivered when you register as a new customer. To claim the additional £5 off, you need to create a new account, have both games in your basket and use the voucher code TDX-HQ9T when you check out. A bargain price for the biggest selling games of 2013. As ever, there are plenty more deals below to choose from, so whatever you're looking for, you can save some cash on your next tech purchase.